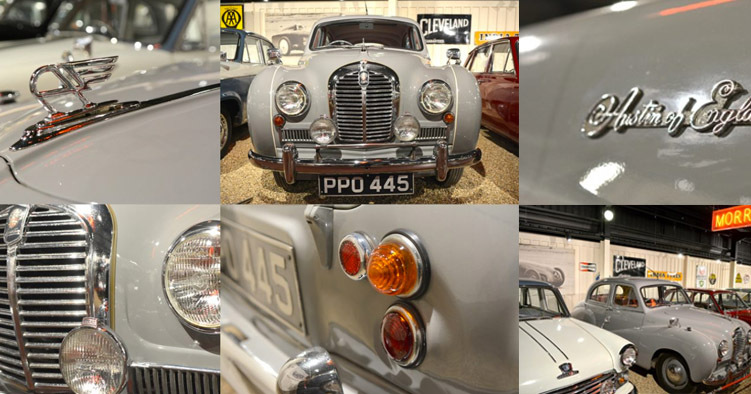 Haynes International Motor Museum is planning a special road trip in a car from the Museum Collection this Somerset Day (Saturday 11 May) for The Great Museum ticket Giveaway. We can now reveal that the car chosen bears the same name as the county it is celebrating; the 1954 Austin A40 Somerset. Apprentice, Matthew Garside is busy restoring the A40 Somerset in the Museum onsite Workshop and Restoration Centre in time for its journey. Take a closer look at the A40 and hear more from Matt about his work in this short video HERE. The A40 Somerset is the only car named after the county of Somerset, a county often associated with going on holiday, and follows Austin’s Austin A40 convention in the 1950s of naming cars by their engine power (it had around 42 hp) and counties – other cars included the Devon, Dorset, Hampshire and Hereford. It has a distinctive style with the prominent grill and lines which flowed down from the front wing. One expert calls it – ‘short, chubby and irresistible’. It has the characteristic ‘flying A’ (for Austin) bonnet mascot one of the most charismatic of all such ornaments and even resembles the flying B of Bentley! It has a four speed column mounted gear change with hydraulic drum brakes. There is independent front suspension and a semi-elliptical sprung live rear axle. The lever shock absorbers tended to give a very bouncy ride with wallowy handling. It is regarded by many as the last ‘real’ Austin arriving just before the merger with Morris and having a separate chassis and body. The fascia is largely metal with dual gloveboxes and central gauge pod which made it easy for the factory to produce both right- and left-hand drive versions. It also gives the dashboard a pleasing symmetry, although probably not ideal ergonomics. There are two seats – but they can be arranged as a three seater bench. The steering wheel is massive, with the four speed column mounted manual gear change with four rectangular dials. Access to the rear is awkward – but once you are in there there’s a surprising amount of room. As part of Somerset Day, we’ll be taking the A40 Somerset to various places around South Somerset. Come and find us at one of the stops on our journey for a chance to claim one of the one hundred single entry Museum tickets we’re giving away. To find out where we are, follow our social pages then find us and tell us what you love about Somerset to claim your free ticket. PLEASE NOTE! A limited amount of tickets will be given away at each stop, so be sure to get to us as soon as you can!